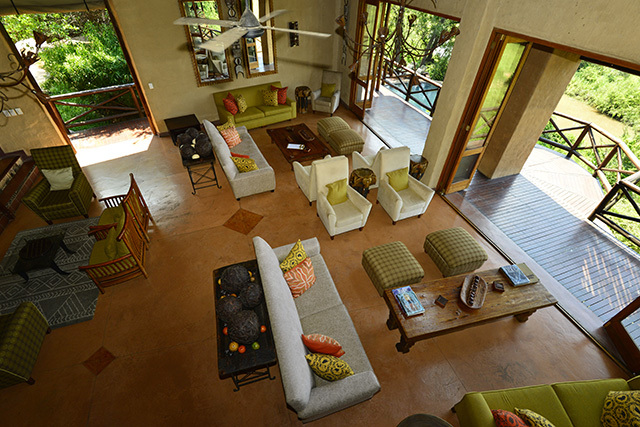 Lukimbi Safari Lodge - a true 5-star safari lodge! the Lodge that makes You Smile! 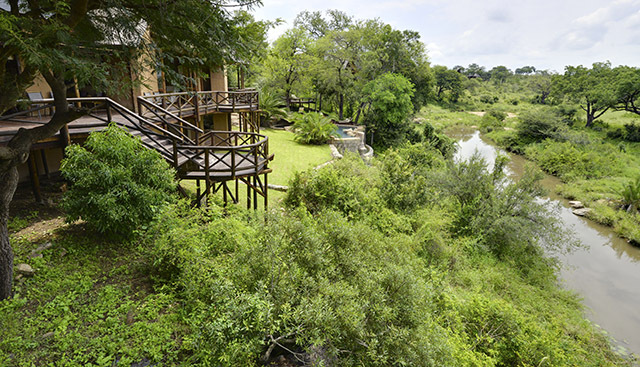 Lukimbi Safari Lodge is a stunning 5 star luxury safari lodge built on the banks of the Lwakahle River, with wonderful views across the river and the beckoning bush below. 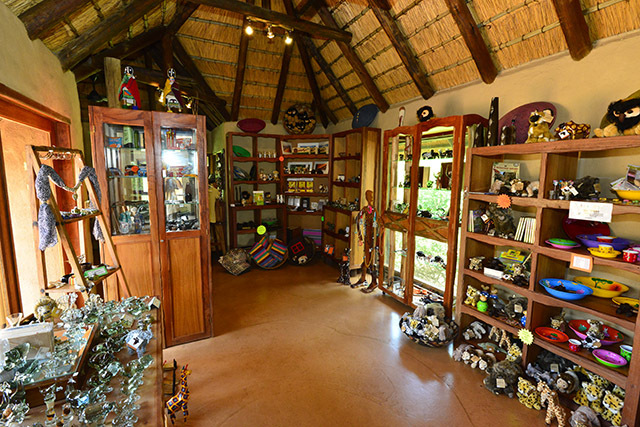 The lodge is named after the legendary ‘Lukimbi’, half lion and half giant eagle owl and is situated on a private concession within the southern Kruger National Park; easily accessible through either Malelane or Crocodile Bridge gates. On arrival at the lodge we had no idea what to expect as we have never stayed here before – we were warmly welcomed by Mariska with nice hot face cloths to remove the dust from our drive there, then Sean and Shelley, the Lodge's GMs came to greet us - what a warm and friendly couple, we felt like we had come home. 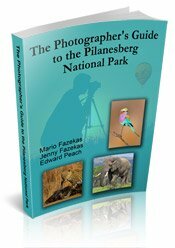 This beautifully laid out lodge is a photographers’ delight because of the many beautiful viewing points and the lodge provides lots of nooks and cranny’s with something different around every corner. 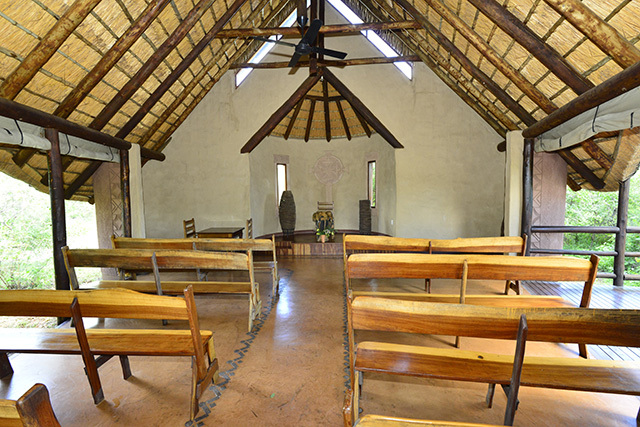 We were constantly finding new places to explore, like the gym, a conference centre, a TV lounge and a beautiful Chapel. The main building consists of upstairs and downstairs areas. Upstairs consists of the reception, a lovely curio shop with artistic creations and a cosy library that has many interesting books as well as a computer station for guests who want to access the internet. The wide staircase then leads down into the gorgeous open lounge with large folding doors and a huge carved fire-place that warms you during the colder winter months. Then, just off the lounge, is the bar area where we gather for drinks before going to dinner, which then leads into the dining room. 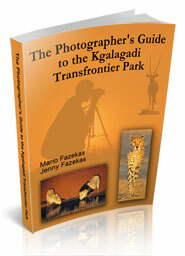 All these areas have captivating views over the river and bushveld. From the communal lounge and dining area you look down onto a beautiful rock pool with wooden deck for lounging round and soaking up the African sun. Meal times are a treat - wonderful 4-course dinners that you can have in the main dining room or on the open deck, where breakfast and lunch are both served. There is a splendid selection of wines for the perfect accompaniment to your dinner of brown lentil and truffle soup, Roasted Springbok with red cabbage, parsnip & madeira jus then the delicious dessert of a vanilla panna cotta with berry coulis. 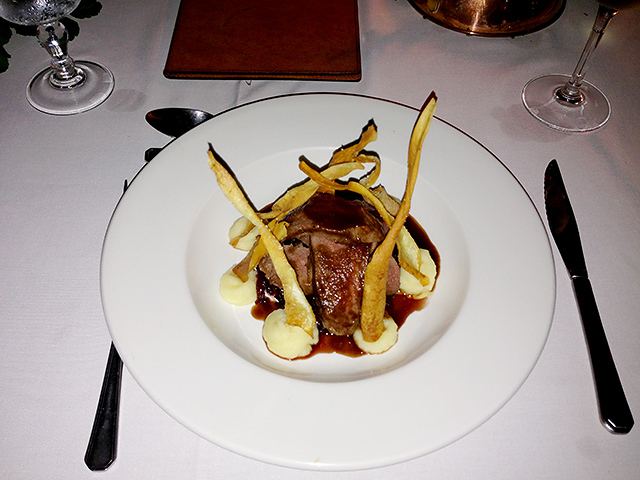 With such excellent food, great service, good company and a lovely glass of wine, how can you possibly go wrong? 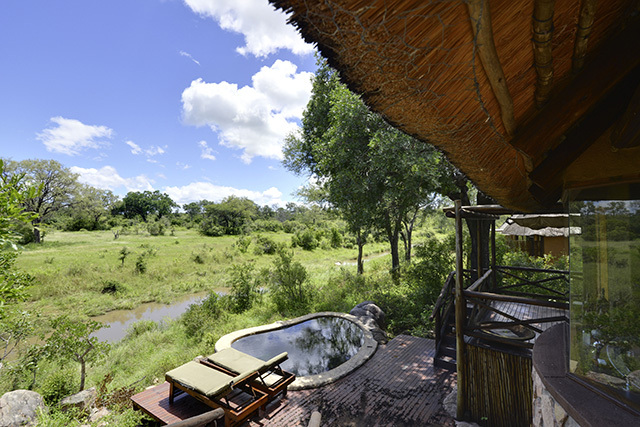 Suites W1 to 9 on the west (Warthog) wing provide panoramic views of the bush veld and river below. All the chalets are connected to each other and the main lodge by a series of wooden walkways. The classic suites have beautiful high windows allowing you to watch the stars at night while lying in your double bed. From the bedroom area you step into the sunken lounge which leads onto a covered wooden deck. This is a great place to relax while you watch the animals and let the birds enchant you. 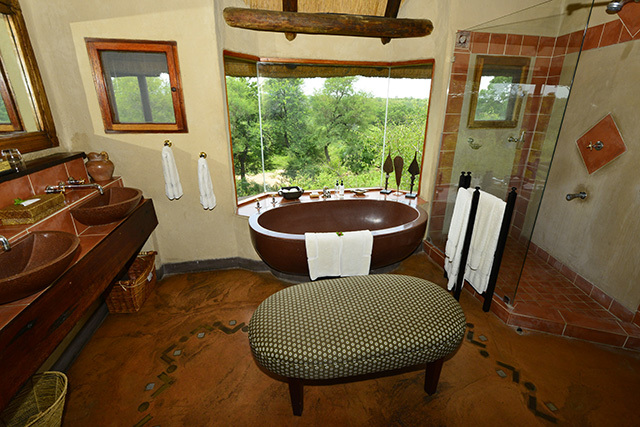 The large bathroom is stunning with its huge glass windows allowing you to look onto the bush while relaxing in your bath tub. 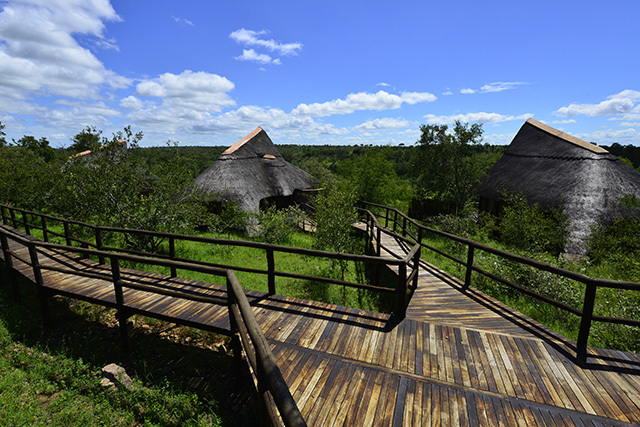 Each suite has a bath tub, indoor and outdoor shower, separate toilet - also with a view of the bush - air-conditioning, ceiling fan, mosquito net, fully-stocked mini bar, books and magazines, plug points, hair dryer, safe and a tea and coffee station. 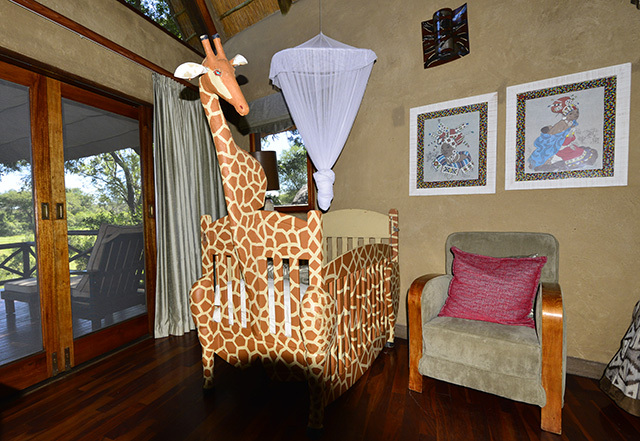 There is enough room to share the space if you have young children and Safari beds and cots are available on request. 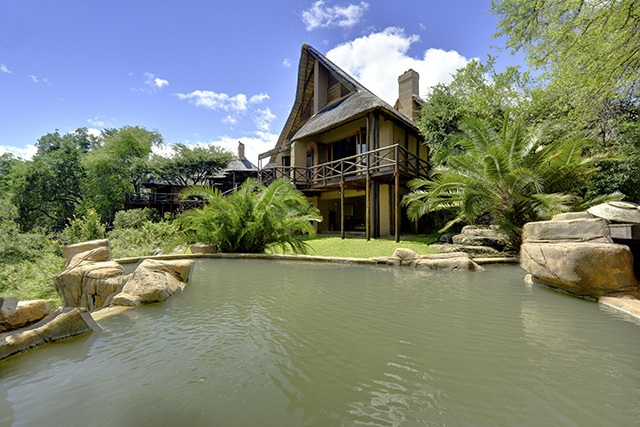 The two ultra-luxurious premier suites; Giant Eagle Owl and King Cheetah are on the east wing and feature a separate bedroom, dining area, large sunken lounge, a main bathroom with bath, an inside shower plus outdoor shower, a second bathroom and a stunning private pool with wooden deck that overlooks the river and bush. 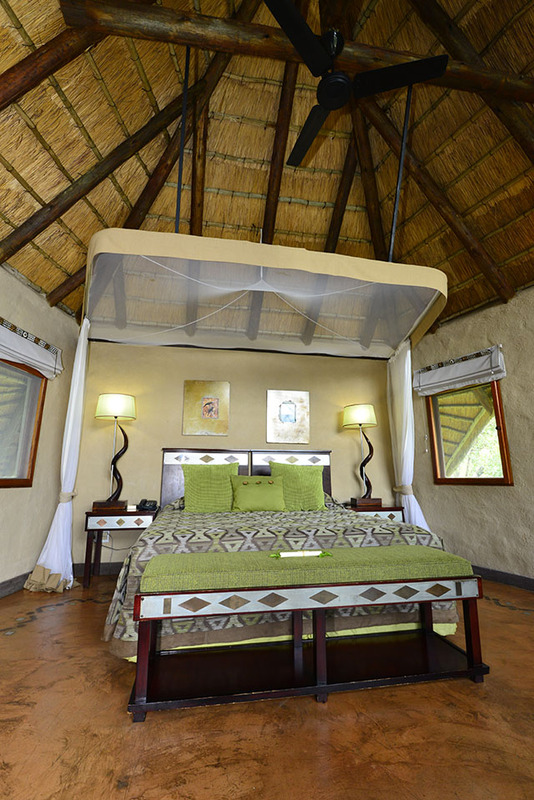 The suites have air-conditioning, ceiling fan, a safe, mosquito nets, mini bar and tea and coffee facilities. A decanter of sherry, compliments from the lodge, is there for your enjoyment – great for the chilly winter nights! 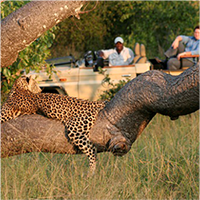 Animals are a very special part of Lukimbi Safari Lodge and often an elephant and sometimes a leopard will drink from the pools on their way through the bush. 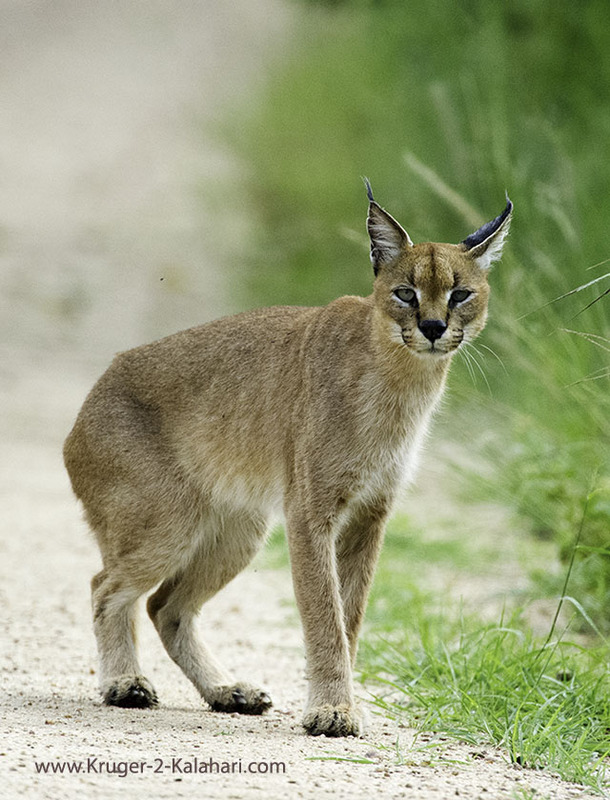 Keep a lookout for the resident porcupine that lives under the main building and also caracals, of which we had three sightings in 2 days! 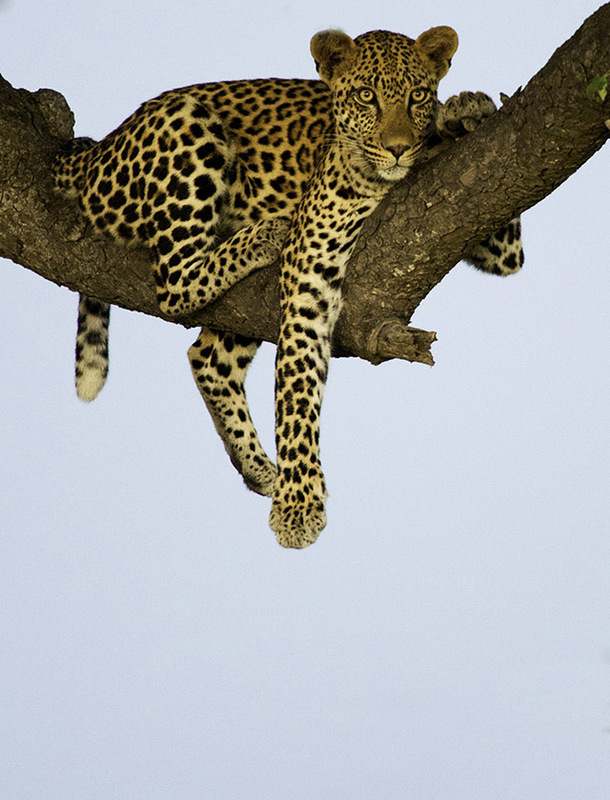 Morning and afternoon game drives, with over 37,000 acres (15,000 hectares) of traversing on the many private roads in this stunning game rich area, means you will have the sightings to yourselves without 10 or more other vehicles jostling for position! 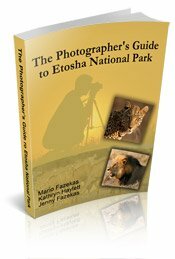 KK and Gideon, our tracker and ranger, provided us with some awesome sightings of lion, rhino, buffalo, elephant and wild dogs, not to forget the three caracal sightings we had close to the lodge and the leopard in a tree on our last night!. 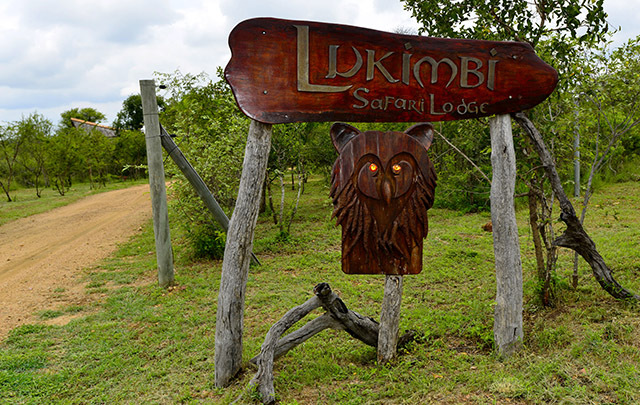 Lukimbi Safari Lodge is a superb lodge that provides a true five-star safari experience! 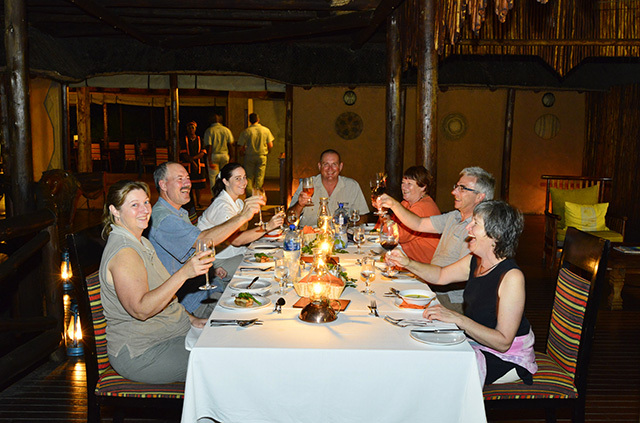 For more information on Lukimbi Safari lodge or to make your booking please click here.